Joshua Davis is a writer, film producer and co-founder of Epic Magazine and Epic Digital. He is the author of the book Spare Parts (Farrar, Straus, Giroux, 2014), which was adapted into a film by Lionsgate starring George Lopez, Marisa Tomei, and Jamie Lee Curtis. In 2001, Josh became part of the US Arm-wrestling Team after placing fourth out of four in the lightweight division at the National Arm-wrestling Finals. As a result, he traveled with the US team to Poland to compete in the World Arm-wrestling Championship where he placed 17th out of 18 (the 18th guy didn’t show up). Josh has never won a competitive match, but he is now an internationally ranked arm-wrestler. The documentary film he directed about his experiences won Best Documentary at the Telluride Mountain Film Festival. In 2003, Josh covered the Iraq war for Wired Magazine, where he is a Contributing Editor. He has tracked rumors of genetically modified cocaine behind rebel lines in Colombia, investigated the world’s largest diamond heist, and hunted the source of a cyberwar in Russia. Josh’s work has thrice been selected “Best of Technology Writing” by Yale University Press and has also been anthologized in the 2007 and 2012 editions of “Best American Science Writing.” In 2014, he was nominated for a National Magazine Award. In 2005, Random House published Joshua Davis’ memoir, The Underdog, which details his journey through some of the world’s most outlandish competitions. The Los Angeles Times calls it “laugh out loud funny,” and Entertainment Weekly declares “the rewarding Underdog proves that Davis is a winner at something.” His magazine writing has appeared in The New Yorker, Wired, GQ, Outside, Food & Wine, Men’s Journal, Men’s Health and Maxim. In 2013, Josh and Joshuah Bearman formed EPIC, a magazine devoted to extraordinary true stories. The venture comes on the heels of Argo, the Academy Award-winning film, which was based on an article Bearman wrote. Over the past 10 years, Josh and Bearman have sold 22 articles to Hollywood, with 2 films produced. Josh was a finalist for the 2014 National Magazine Award in Feature Writing. You can follow Josh on Twitter. Corporate Storytelling Josh is a master storyteller. His work has been selected "Best of Technology Writing" three times, and he's received a nomination for feature writing for the National Magazine Awards. He's also helped sell 22 journalism articles to Hollywood, one of which was the basis for the Academy Award-winning film Argo. 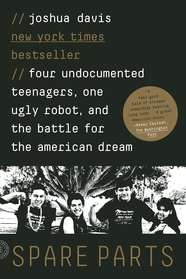 Inspirational Stories Whether it's chronicling the careers of sauna-ers, arm wrestlers, and other bizarre athletes, or revealing how a group of undocumented Mexican Americans beat the odds to win a robot-building contest, Josh is a master of the underdog tale. In addition to relaying the stories of some of his subjects, he reveals some of the personal obstacles he's had to overcome. Read a New York Times article about Joshua Davis’ writing. Read the Washington Post’s review of Spare Parts. Check out Joshua Davis’ website, twitter, and Facebook. "Joshua Davis was the most gracious author I have ever hosted! He was so kind and heartwarming. He ended up doing book signings every event we had. The students, staff and community really enjoyed his presentations!" "It's amazing when a presenter can captivate an entire auditorium of students, based simply on spectacular storytelling skills - no games, gimmicks, or videos. Joshua Davis connected with the audience by demonstrating deep empathy and understanding of the difficulties and hardships many students face, so much so that the entire audience broke out in to applause several times without cue. He inspires all of us, even those with seemingly little hope, to step out of our comfort zones and take chances." "Josh Davis was one of the best speakers we have ever had. He was dry and self-effacing but pointed in his commentary regarding both his career and his subjects.He raised great questions regarding our immigration and education policies. I particularly enjoyed his politically incorrect comments regarding the stultifying nature of remedial English and Math. The "Spare Parts" story also challenged the issue of how to tap into the potential of our undocumented immigrants and our neighbors in border and near border nations. Definitely a challenge for the 21st century." "I thought his talk was fun and informative. He showed the students that you can major in one area and go into a different field and you can grow from your life experiences. He explained how taking risks (with the arm wrestling contest) led him to a career in journalism. He also broke down the stereotypes some students might have about undocumented students and what happens to those students after they leave high school and go into the world. Due to our laws and other factors, some of the students they beat in the competition are now successful professionals making a lot of money, whereas the heroes in the book have had to struggle a lot more. It sparked thinking about the immigration debate." "Josh hit it out of the ballpark. His kindness and attentiveness to our students made a huge impression, and his wonderful talk was a huge hit. He connected with everyone around him and I received great feedback from so many people. He made the day--and his work--unforgettable."